A gardener and farm worker has access to lots of summer vegetables, especially “farm seconds.” It is difficult to use them up before they turn to compost. The recipe for roasted red pepper and tomato soup is simple and the results are sweetly tasty. It was born of an abundance of bell peppers and tomatoes. I wouldn’t expect anyone to go to the market and buy ingredients for this dish. If one has the peppers and tomatoes, almost everything else is on hand in a well stocked kitchen. 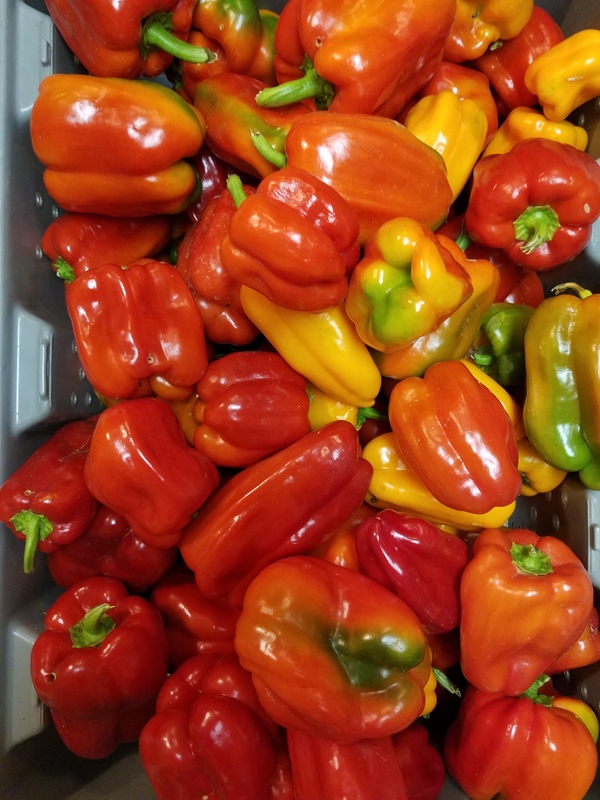 Make a batch or two of roasted bell peppers for the soup and to use in other dishes. Preheat the oven to 450 Degrees Fahrenheit with the shelf in the middle position. Cull the best red peppers from the lot, halve them and remove the membrane, core, seeds and any bad spots. Using a melon baller makes it super easy and more precise in removing all of the membrane. Peppers needn’t be perfectly halved. Put them skin side up on a piece of parchment paper on a baking sheet with sides. Nestle them close together to get as many as possible on the baking sheet. Bake at temperature for 25 minutes and remove from the oven. Using tongs, move the roasted peppers to a bowl and cover it with a plate. This process helps loosen the skin. Let them sit until they can be handled without burning fingers. One-by-one take the pieces of pepper and remove the skin. Place them in a refrigerator dish and refrigerate until ready to use. 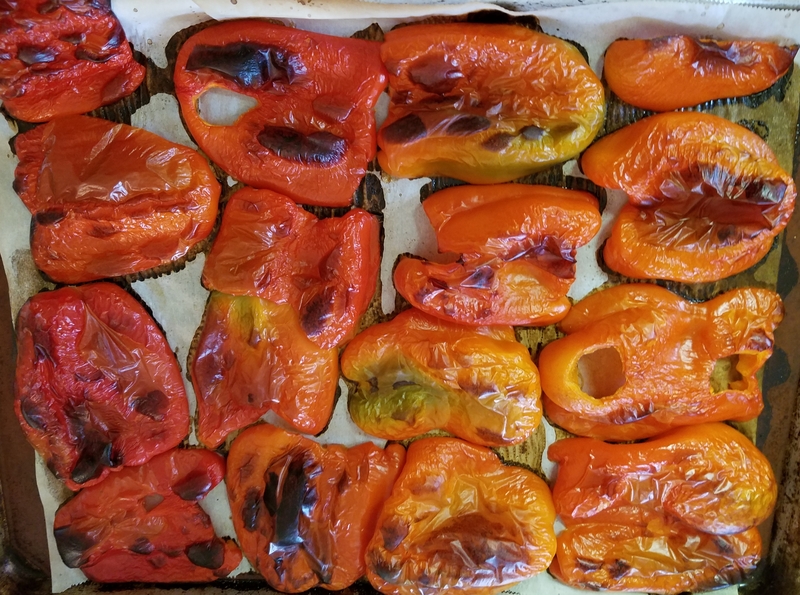 Roasted red peppers are an ice box staple during pepper season. For longer storage there are recipes for oiling and preserving them. They are so sweet and tasty they won’t last long in most households. This recipe makes two quarts, enough to serve four – five people. Add one cup vegetable broth to a Dutch oven and bring to a boil. Equivalent of 5-6 large tomatoes, one-inch dice. Enough roasted red peppers to approximately equal the weight of the tomatoes, maybe a little less. One six ounce can prepared tomato paste. One teaspoon each dried spices including smoked paprika, granulated garlic and thyme. Fresh is better if you have it. Double the amount if you do. Herbs and spices are always to taste. One tablespoon dried basil. Fresh basil is better. Double the amount if you have it. Two tablespoons dried onion flakes. One tablespoon sweetener. I used sugar because it was in the pantry. Teaspoon of red pepper flakes, cayenne pepper or your favorite pepper spice (optional). Stir to incorporate the ingredients, bring to a boil and turn down to a simmer. Cook until the tomatoes begin to soften. Don’t cook the tomatoes to death. You will want some bits of recognizable tomato granules in the final product. Either transfer the mixture to a blender or use an immersion blender to smooth it to a pleasing texture. As mentioned, I like little bits of recognizable tomato and pepper. Add one cup half and half and stir constantly until the soup is well-mixed and up to temperature. Serve hot, garnished with fresh basil, a dollop of sour cream or snipped chives. Whatever looks appetizing and is available. This recipe was fun to make and better than manufactured roasted red pepper and tomato soup in aseptic containers. Leftovers, if any, will keep for a couple of days. This entry was posted in Cooking, Local Food and tagged cooking, peppers, recipes, tomatoes. Bookmark the permalink. My pole this is Paulette Motzko in Las Vegas Nevada. Great post you did here! I just shared it on cooking up a storm with Miss Polly.com. Supposed to read Hi Paul-great post! Sometimes my Galaxy Note 4 has a mind of its own!